We support you, we love you. We got your front. Visit Belle Lacet Lingerie for the perfect bralette for your unique shape and let your natural shape take center stage! Our professional bra fitters will assist you in finding the bralette with the right amount of comfort and support. All the bras at Belle Lacet Lingerie, including bralettes, come in sizes A to K. Our goal has always been to help you look and feel your best. We offer free professional bra fittings and carry a huge selection of bras in hard to find sizes. 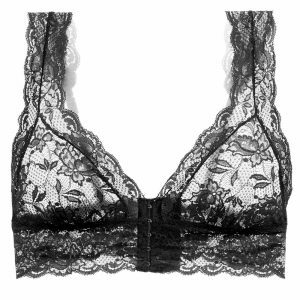 If you like low-back tops this fresh and flirty bralette from Chantelle is perfect from sleep to street! Comfortable and light enough for lounging, but plenty of support and security. Sizes available up to a G cup. Specifically designed for larger busts but smaller rib cages, the Curvy Sweetie Bralette models bigger cups for more coverage and a smaller band under the bust. An all over lace tall triangle bralette finished with a scalloped lace trim. Adjustable corset style hook and eye front close bra. Thick lace shoulder straps. Adjustable shoulder straps. The Never Say Never Sweetie bra from Cosabella features allover scallop edge lace trim and lies gentle on your skin. The lace is semi sheer. Fashion meets function with Curvy Couture’s newest plunging bralette featuring soft delicate embroidery overlay and a floating underwire. Designed flat for versatility. Underwire does not extend to the edge of the bra.. Create a jaw-dropping silhouette with this long-line favorite. Elissa’s sophisticated, scalloped lace highlights the three-part cup design. Designed with anti-slip silicone tape to keep everything in place for all-day support. Freya Fancies are designed to perfectly mix and match with our stunning new season collections. The bralette offers a soft cup style with delicate stretch lace and a double layered fabric for perfect support, shape and complete comfort. Adjustable straps offer additional anchorage. Lace Bralette with deep plunge front. Lace bralette with race back eetail and mesh lining. Adriana is a Lace Bralette that comes in bra sizes. Her wireless cups and structured band add support and create the perfect lounge bra!